We only use the best materials to make up our superior awning designs. At Caribbean Blinds one of our primary focuses is to ensure that we deliver the best Patio Awnings money can buy which is why we take great pride in the detail of the design and manufacturing. We use skilled technicians that are precise and attentive to each garden awning that is produced in our factory with each awning going through a rigorous quality control process. We use the finest materials in the industry to make up our superior retractable awnings so that we equip our clients with an awning that is reliable and robust throughout all the seasons. Earlier this year we recently released our new World of Sattler acrylic awning fabric collection that consist of an array of contemporary patterns. This fabric range is the most technologically advanced fabric in the industry and is exclusive to Caribbean Blinds. One of the features we want to highlight today is the TEXgard solution that is entwined within each fibre of the fabric pattern. TEXgard is a Nano-Tech compound that fuses with the fibres to create a protective layer that repels any form of moisture trying to filter through. 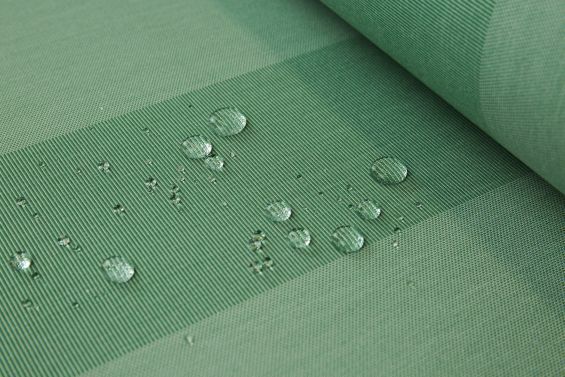 As soon as any moisture makes contact with this innovative fabric the moisture will simply stay formed and roll off the fabric like ‘water off a ducks back’. Any loose dirt that has been building up on the fabric will soon be washed away with the repelled moisture giving the clients a self-cleansing and long lasting fabric that they can trust. An awning fabrics waterproof abilities is something that clients always have concerns about because they want an outdoor awning that is going to be able to tackle the British Climate without sustaining damage. When we show our clients the TEXgard abilities of our fabrics they are certainly impressed. Just take a look at our short video and see for yourself. If you would like to find out more about the great benefits of our Prestigious Patio Awnings then visit our dedicated website or you can talk to one of our knowledgeable advisors on 0344 800 1947.